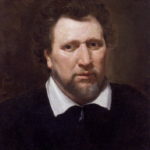 Ben Jonson was an English playwright, poet, actor, and literary critic, whose artistry exerted a lasting impact upon English poetry and stage comedy. He popularized the comedy of humours. He is best known for the satirical plays Every Man in His Humour (1598), Volpone, or The Fox (c. 1606), The Alchemist (1610) and Bartholomew Fair (1614) and for his lyric and epigrammatic poetry; he is generally regarded as the second most important English playwright during the reign of James VI and I after William Shakespeare. "He knows not his own strength that has not met adversity." "Success produces confidence; confidence relaxes industry, and negligence ruins the reputation which accuracy had raised."